The European Space Agency has announced that the James Webb Space Telescope will finally be launched aboard an Ariane 5 rocket in October 2018. The new telescope, which is planned to search space for the first galaxies in the Universe, as well as finding new stars and planets, has already been a long time in production. 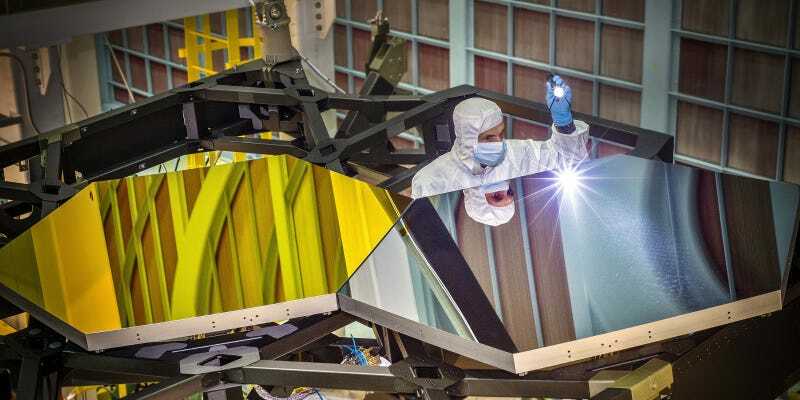 But then, it is a pretty serious piece of engineering, weighing in at 6.6 tons with a 6.5-meter diameter mirror—test sections of which you can see being inspected in the image above. Shiny. The telescope will be launched in a folded position aboard Ariane 5 from the European Spaceport in Kourou. Once in space it will unfurl, before taking up position 1.5 million kilometers from Earth on the anti-sunward side.